might be good for a change with a bit of old fashioned quietness...and making young cashiers actually count for a change...probably nothing much else is bad news there,GDL. We hypothesize that the solar cycle has sufficiently important effects on the climate along the southern shore of the St. Lawrence estuary to locally influence terrestrial ecosystem functioning. Using North American porcupine (Erethizon dorsatum) feeding scars on trees as an index of past porcupine abundance, we have found that porcupine populations have fluctuated regularly over the past 130 years in the Bas St. Laurent region of eastern Quebec, with superimposed periodicities of 11 and 22 years. Coherency and phase analyses showed that this porcupine population cycle has closely followed the 11‐ and 22‐year solar activity cycles. Fluctuations in local precipitation and temperature were also cyclic and closely related to both the solar cycle and the porcupine cycle. Our results suggest that the solar cycle indirectly sets the rhythm of population fluctuations of the most abundant vertebrate herbivore in the ecosystem we studied. We hypothesize that the solar cycle has sufficiently important effects on the climate along the southern shore of the St. Lawrence estuary to locally influence terrestrial ecosystem functioning. This constitutes strong evidence for the possibility of a causal link between solar variability and terrestrial ecology at the decadal timescale and local spatial scale, which confirms results obtained at greater temporal and spatial scales. Porcupine Feeding Scars and Climatic Data Show Ecosystem Effects of the Solar Cycle. Possible link to jet-stream anomaly in the sth hemisphere with the Equinox and lunar position over the equator. I tripped across this interesting correlation although very very tentative l thought it worth to follow in the future. I had noticed whilst observing cloud patterns in the sth hemisphere this year that long cloud bands( from equator to poles) )often referred to as NW cloud bands appear intermittently and what l thought somewhat periodically. I have since learnt that a meridional pattern of the jet-stream is associated with a higher amplitude jet-stream roller coaster for want of a description. The past few weeks there has been very large bulges of antarctic cold pools emerging and also large jet-stream roller coasters some of the largest l have ever viewed. Below is a diagram showing how when the sun is over the equator at equinox and when the moon is also over the equator at the same time there is a possibility the jet-stream become highly meridional and cold air excursions from the south pole. This may not be evident in the nth hemisphere because of the land masses. Note that the horizontal components of tidal accelerations are maximized on the Earth's surface about one eighth of the circumference from the point on the surface where the Moon (or Sun) is directly overhead or on the opposite side of the Earth, and it is these horizontal components that accelerate the currents that move the ocean water toward where the Moon (or Sun) is directly overhead or on the opposite side of the Earth. It could also be noted that the ocean currents along the equator are looking strong easterly atm? Not sure where to put this one as it deals with historical climate changes of a couple of thousand years ago but as solar cycles comes into it I have placed it in this thread. The paper below or at least what is available to the non paying public, covers an piece of history which was completely unknown to myself and I have read a fair bit of history as one of my regular interests. And the conclusions in the paper are very interesting and once again history gives the lie to the claims that increasing CO2 is the cause of any significant warming and the still to be understood solar variations and solar cycles, both short term and long term are the driving forces of the changes in the Global climate. And once again history tells us that cold temperatures are quite devastating for mankind's civilisation and a cold climate is a dry arid climate. And a cold climate is what the climate alarmists seem to want judging by all their squawkings but they never seem to be able to come up with a temperature figure on just how cold they want the Earth to become before they are satisfied that a global warming catastrophe is no longer possible. The real catastrophe will be IF the earth does cool as an increasing number of solar physicists are suggesting as this solar cycle indicates a much decreased solar cycle activity during the next few cycles and thereby the global climate becomes colder, drier and more arid as we see from the contents of this paper below. With the increasing global population and global food supplies in a balance right now such a global cooling could be devastating for the world's food supplies. The paper following is from the ; "Journal of Archaeological Science"
Between the 13th and 11th centuries BCE, most Greek Bronze Age Palatial centers were destroyed and/or abandoned. The following centuries were typified by low population levels. Data from oxygen-isotope speleothems, stable carbon isotopes, alkenone-derived sea surface temperatures, and changes in warm-species dinocysts and formanifera in the Mediterranean indicate that the Early Iron Age was more arid than the preceding Bronze Age. A sharp increase in Northern Hemisphere temperatures preceded the collapse of Palatial centers, a sharp decrease occurred during their abandonment. Mediterranean Sea surface temperatures cooled rapidly during the Late Bronze Age, limiting freshwater flux into the atmosphere and thus reducing precipitation over land. These climatic changes could have affected Palatial centers that were dependent upon high levels of agricultural productivity. Declines in agricultural production would have made higher-density populations in Palatial centers unsustainable. The ‘Greek Dark Ages’ that followed occurred during prolonged arid conditions that lasted until the Roman Warm Period. Fig. 3. Eastern Mediterranean sea surface temperatures (SST) as indicated by alkenone temperatures and warm-species formanifera. A drop of SST can indicate lower levels of evaporation, which in turn indicate less precipitation. The Ionian Sea (top line; Emeis et al., 2000) dropped by 4 °C following the LBA Collapse (a). Temperatures returned to their pre-LBA Collapse levels during the Roman Warm Period (b). A drop of 3 °C during the Medieval Warm Period (c) occurs as well. Adriatic SST (second line; Sangiorni et al., 2003) dropped 1–2 °C after the LBA Collapse (a), however a 25% reduction in Adriatic warm-species dinocysts (third line; Sangiorni et al., 2003) before the LBA Collapse (a) suggests cooling may have been rapid and severe. A similar decline in warm-species formanifera in the Aegean Sea (last line; Rohling et al., 2002) at the same time suggests significantly cooler waters as well. Dark shading around lines represents 95% confidence bands. Fig. 4. Greenland Ice Sheet Project (GISP2) Temperature (top line; Alley, 2004) and a 20-point moving average of Solar Irradiance (bottom line; Steinhilber et al., 2009) for the past 5000 years. A large increase and sharp decrease in Northern Hemisphere temperatures occurred during the LBA Collapse (a). Similar (albeit smaller) temperature decreases terminated the Roman Warm Period (b) and Medieval Warm Period (c). Low solar irradiance, periods typified by low sunspot activity, are associated with cooler SSTs. Low solar irradiance occurred during the Greek Dark Ages (d), potentially contributing to continued low SSTs. This period of low solar irradiance is comparable to the more well known Maunder Minimum (e). This paper may be of great interesting to some reading this thread . Not sure as I have only rarely looked at this blog I have linked to but I think it normally carries a lot of pro AGW stuff so if thats the case this blog article marks another point in the shift away from the AGW belief towards a far more rational look for the real drivers of global climate change of either and both signs. I will quote from the conclusions of this post but trying to say that the warming of the Earth since 1880 in the "Conclusions" is due to human influence when there is NO evidence of such an anthropogenic influences and even the IPCC says that such Anthropogenic warming only started in about 1980 is really just pure hogwash. Further if that warming from 1880 is supposedly caused by human influences then the it would also have to be assumed that the cooling of the 1950's, 60's and particularly the early 1970's must also have arisen as a result of human influences on the climate. There is little doubt that human CO2 emissions have played a significant role in Earth’s current warm period. The Earth is about 1°C warmer than it was in 1880. The IPCC has considered but rejected solar activity as a cause. The IPCC has rejected all possible causes of current global warming except AGW – Anthropogenic (human caused) Global Warming. Times are a changin’! The impact of solar variation is becoming clearer. The amount of irradiance change so far directly measured on the sun is insufficient to explain the global warming observed. But direct radiant energy variations have only been measurable since about 1975, a period covering three of the highest solar cycles ever seen. It is completely unknown how much cooling happens during prolonged periods of inactivity like we are entering now. That has yet to be measured. The lesson of history teaches us there will be a noticeable effect. Will AGW or solar variation dominate climate change in the coming decades? See you all later I'm taking a break from here, it is no use being on here anymore, the one person has wrecked it for all. Thanks to all the nice folk here. Cheers and blessing to you all. I may come back some time, not sure. Leif the expert has spoken...interesting times ahead! There is no doubt that the Sun is ‘up to something’. What it is we don’t know. One may speculate that a Maunder Minimum is in the cards." 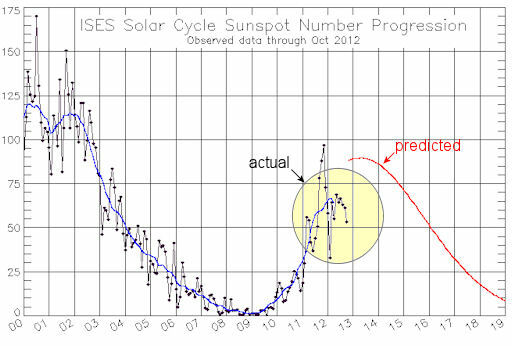 He was one of the two panel members in May 2009 who differed sharply from the other panel members in that he along with another member believed the peak sunspot number for cycle 24 would be down around a very low 72 whereas the other members believed the peak sunspot number would be around 90. "There is no doubt that the Sun is ‘up to something’. What it is we don’t know. One may speculate that a Maunder Minimum is in the cards." It is an extraordinary statement in that Svalgaard, a conservative and self assured scientist if ever there was one, is suggesting a slow down in solar activity similar to the Maunder Minimum which would indicate that the solar activity set up is now getting far beyond what solar science believed was the Sun's accepted operating mode. In his regular comments on WUWT I have never seen Svalgaard make such an admission to an ignorance of the Sun's future activities before. To suggest that a deep Maunder type Minimum which ran for 70 years from 1645 to 1715, much deeper and longer than the Dalton minimum of 1785 to 1815 is quite extraordinary. There is no doubt that the Sun is ‘up to something’. What it is we don’t know. One may speculate that a Maunder Minimum is in the cards. Proff.David Archibald of WA has in fact been predicting this drop off in solar activity and a very low activity solar cycle 24 plus a whole continuation of low activity solar cycles for some decades to come with a consequent fall in global temperatures back into Dalton and possibly Maunder Minimum type global climate conditions for some 3 or 4 years now and it looks like he might be right. The possible onset of a low solar activity cold climate associated " Eddy Minimum" is bad enough. But we also now have the colder climate La Nina dominated Negative PDO phase now operating for possibly the next two to three decades as well to reinforce the probability of a significant drop in global temperatures by about 2015. Then the switch over from the present warm phase of the 60 to 80 year long Atlantic Multidecadal Oscillation to the cool phase is likely around or before 2020. Combine all of these major ocean and atmospheric phase changes to create a general global cooling phase plus the Sun really hitting the low activity stops around 2015 / 2020 and the possibilities of a much colder global climate is starting to be a bit too realistic for anybody who takes even a cursory look at the impact on global food production and global energy supplies to both easily dismiss and not get seriously concerned about. BD has the appropriate solar activity graphs above. So here is a selected AMO graph from the NCAR. The Atlantic Multi-decadal Oscillation (AMO) is a mode of natural variability occurring in the North Atlantic Ocean and which has its principle expression in the sea surface temperature (SST) field. The AMO is identified as a coherent pattern of variability in basin-wide North Atlantic SSTs with a period of 60-80 years. From the Solar cycle Prediction panel site above we have this graph of solar activity since 1600. The Maunder Minimum is very clearly defined and the Dalton minimum from 1785 to about 1815 is also clearly seen in the dip in solar activity. And an appropriate quote from the late John [ Jack ] Eddy who was the first to identify that our sun is a variable star after he researched and identified both the Maunder and Sporer minimums. The upcoming solar minimum is already being tagged as the "Eddy Minimum" in honour of Jack Eddy and his contribution to astrophysical and climate science. "It was one more defeat in our long and losing battle to keep the Sun perfect, or, if not perfect, constant, and if inconstant, regular. Why we think the Sun should be any of these when other stars are not is more a question for social than for physical science." Bugger that is going to mean a lot more hungry people on the planet if this happens. I'm still of the opinion that the impact of quiet or active solar cycles is more of a cumulative one than instantaneous. It has been mentioned in scientific research that there is a difference of about 0.2C in global temps from max to min. I believe that in the stronger cycles not all the 0.2C increase is removed before solar mininum and that for the 3 strong cycles we accumulated about 0.1C per cycle. I think the current cycle 23 whilst quieter was probably fairly neutral (it didn't add anything further but it wasn't quiet enough to drop off temps either). I think solar cycle 24 will start to drop off temps but we wont really see the impact until we reach next minimum but the real kicker is going to be if activity in cycle 25 is historically low. So in summary I'd say maybe a 0.05 to 0.1C drop through to 2020 but potentially 0.2C (or more if other natural climate cycles play a part). There seems to be quite a bit of alarmist talk of impending doom from a possible future Maunder Minimum. This scenario has been well researched and the finding is that there would not be much of an effect at all if we were to enter a Maunder Minimum. The current exceptionally long minimum of solar activity has led to the suggestion that the Sun might experience a new grand minimum in the next decades, a prolonged period of low activity similar to the Maunder minimum in the late 17th century. The Maunder minimum is connected to the Little Ice Age, a time of markedly lower temperatures, in particular in the Northern hemisphere. Here we use a coupled climate model to explore the effect of a 21st-century grand minimum on future global temperatures, finding a moderate temperature offset of no more than −0.3°C in the year 2100 relative to a scenario with solar activity similar to recent decades. This temperature decrease is much smaller than the warming expected from anthropogenic greenhouse gas emissions by the end of the century. Global mean temperature anomalies 1900 to 2100 relative to the period 1961 to 1990 for the A1B (red lines) and A2 (magenta lines) scenarios and for three different solar forcings corresponding to a typical 11-year cycle (solid line) and to a new Grand Minimum with solar irradiance corresponding to recent reconstructions of Maunder-minimum irradiance (dashed line) and a lower irradiance (dotted line), respectively. Observed temperatures from NASA GISS until 2009 are also shown (blue line) (Feulner 2010). That "bet" to be that the global temperature will have risen at a rate and to a level commiserate with an above 2 C rise by the end of the century. For even better odds why not make that at a rate of and equal to a 3 C degree rise by the end of the century as per CB's graph to be collected in 20 or 30 years time. Until the warmists are prepared to do something like this they are just blowing in the wind and drawing silly graphs but don't apparently believe their own hype. Typical hide it under the carpet response from AGW side. it is not going to stop now. 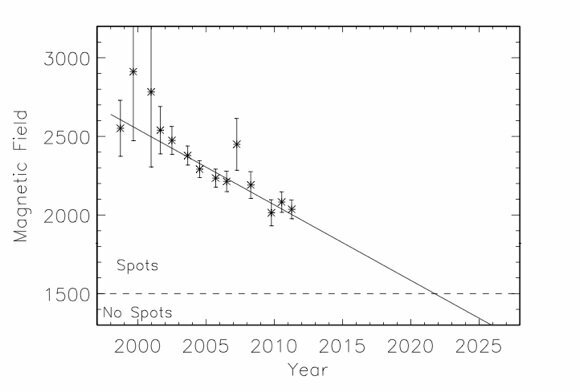 There is a solar lag of in the main correlation 10 t0 17 years from my and others observations. The lower solar cycles have not yet cut in but should do soon in the next few years or so to a much greater degree. large eruptions will really send things into a spiral downwards temp wise. The fact that Leif says that (as ROM has observed & points out, and the reason why I posted the quote in the first place) indicates very interesting and unique new times ahead, we do not really have a full handle on! I wouldn't be paying too much attention to what a highly unreliable bunch of climate models say in relation to the possible impact of a maunder minimum. The only way any of these models carry any degree of accuracy when hindcasting is if past temperatures are massively adjusted to fit. The Little Ice Age is a period between about 1300 and 1870 during which Europe and North America were subjected to much colder winters than during the 20th century. The period and can be divided in two phases, the first beginning around 1300 and continuing until the late 1400s. There was a slightly warmer period in the 1500s, after which the climate deteriorated substantially. The period between 1600 and 1800 marks the height of the Little Ice Age. The period was characterized by the expansion of European trade and the formation of European sea born Empires. This was directly linked to advances in technology harnessing more of nature's power and towards the end of the period fossil-fuelled power. These two hundred years also saw the specialization of agricultural regions, which produced specific products for local and international markets. What caused the Little Ice Age? The cause of the Little Ice Age is unknown, but many people have pointed at the coincidence in low sunspot activity and the timing of the Little Ice. This so called Maunder Minimum2 coincided with the coldest part of the Little Ice Age, in particular during the period roughly from 1645 to 1715, when sunspots were a rare occurrence, as noted by solar observers such as Cassini and Flamsteed3. A minimum in sunspots, indicates an inactive and possibly colder sun and qonsequently less energy output to warm the earth. During the height of the Little Ice Age general, it was about 1 degree Celsius colder than at present. The Baltic Sea froze over, as did most of the rivers in Europe. Winters were bitterly cold and prolonged, reducing the growing season with several weeks. These conditions led to widespread crop failure, famine, and in some regions population decline. The prices of grain increased and wine became difficult to produce in many areas and commercial vineyards vanished in England. Fishing also was bad as the cod migrated south to find warmer water. Storminess and flooding increased. In mountainous regions the tree line and snowline dropped. In addition glaciers advanced in the Alps and Northern Europe, overrunning towns and farms in the process. Iceland was one of the hardest hit areas. Sea ice, which today is far to the north, came down around Iceland. In some years, it was difficult to bring a ship ashore anywhere along the coast. Grain became impossible to grow and even hay crops failed. Volcanic eruptions made life even harder. Iceland lost half of its population during the Little Ice Age. Scandinavia was also hard hit by the colder conditions of the Little Ice Age. Tax records show many farms were destroyed by advancing ice and by melt water streams. Travellers in Scotland reported permanent snow cover over the Cairgorms in Scotland at an altitude of about 1200 metres. In the Alps, the glaciers advanced and bulldozed over towns. Ice-dammed lakes burst periodically, destroying hundreds of buildings and killing many people. " Ice skating on the Thames by 2025? An immediate question is whether this slowdown presages a second Maunder Minimum, a 70-year period with virtually no sunspots [which occurred] during 1645-1715. Early records of sunspots indicate that the Sun went through a period of inactivity in the late 17th century. Very few sunspots were seen on the Sun from about 1645 to 1715. Although the observations were not as extensive as in later years, the Sun was in fact well observed during this time and this lack of sunspots is well documented. This period of solar inactivity also corresponds to a climatic period called the "Little Ice Age" when rivers that are normally ice-free froze and snow fields remained year-round at lower altitudes. There is evidence that the Sun has had similar periods of inactivity in the more distant past. During the Maunder Minimum and for periods either side of it, many European rivers which are ice-free today – including the Thames – routinely froze over, allowing ice skating and even for armies to march across them in some cases. "This is highly unusual and unexpected," says Dr Frank Hill of the NSO. "But the fact that three completely different views of the Sun point in the same direction is a powerful indicator that the sunspot cycle may be going into hibernation." 4 registered (Mike Hauber, Sandbank, Multiversity, Homer), 62 Guests and 4 Spiders online.